The Cuisinart Waffle and Omelet Maker is a breakfast express that lets you whip up an omelet and a Belgian waffle at the same time by just loading your ingredients in one side, close, flip and load ingredients in the other side. In a few minutes you’ve got breakfast for two. The Cuisinart Breakfast Express Belgian Waffle and Omelet Maker has many exciting features for users of all types. You can extend the lifetime of your Cuisinart Breakfast Express Belgian Waffle and Omelet Maker with the purchase of a FactoryOutletStore Factory Protection Plan. 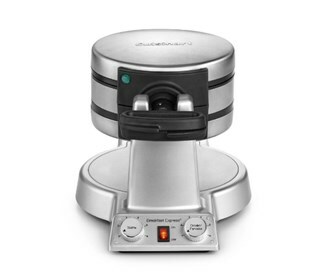 See the Cuisinart Breakfast Express Belgian Waffle and Omelet Maker gallery images above for more product views. The Cuisinart Breakfast Express Belgian Waffle and Omelet Maker is sold as a Brand New Unopened Item.